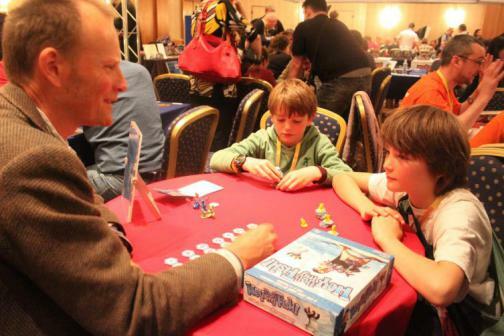 This last weekend was UK Games Expo 2013. 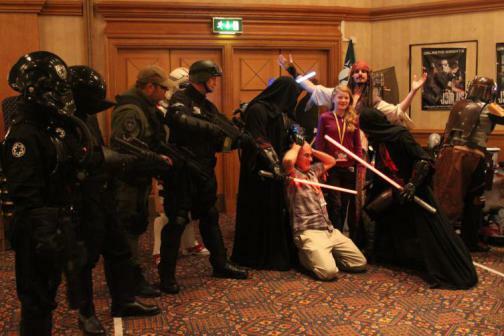 This was the 7th such event but the first in our new venue the Hilton Metropole Hotel at the NEC, Birmingham. 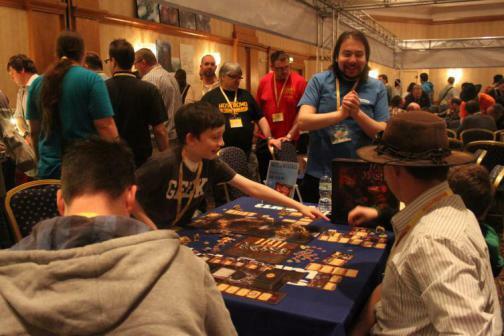 UKGE is the UK’s largest hobby games convention with 3500 individuals attending, most for 2 or 3 days and a total footfall of around 6000. 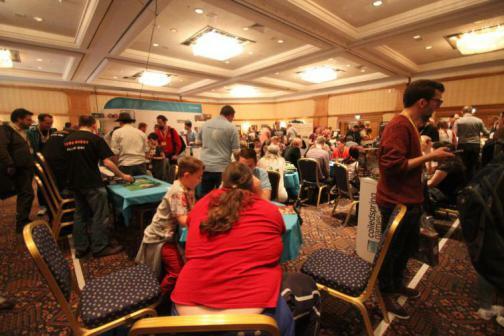 There were almost 100 traders and publishers or exhibitors showing the newest and most exciting board games, card games, roleplaying games and miniatures. 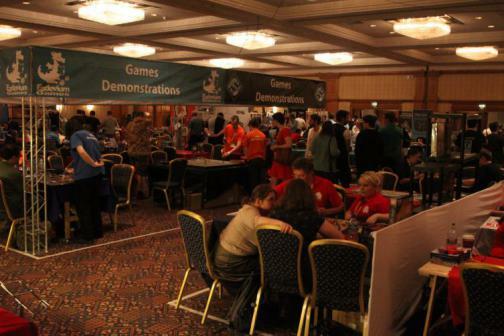 Alongside all this we had a host of costumed groups, hundreds of seats in roleplaying games and tournaments in 20 different games including big national events like the 60 player Xwing UK Nationals and the UK Settlers finals both of which send winners to European and World finals in the USA, Vienna or Germany. It is big, noisy and exciting and from all the feedback everyone had fun despite the price of beer! For the organisers this was the result of two years of planning. The journey began at Expo 2011 when Larry Roznai the C.O.O of Mayfair games made it across for the first time to Expo. He liked what we were doing but told us that the event could be bigger and better if we were willing to take the risk and move to a larger venue. Larry has vast knowledge and wisdom in such matters and his advice sent us to the Hilton. By co-incidence on the same day I emailed the Hilton they emailed me. They had heard of us and were looking to attract us to them. So we went and saw them. Now we did honestly warn them about the sheer scale of what we had in mind but I think – to be frank – they did not really believe us. 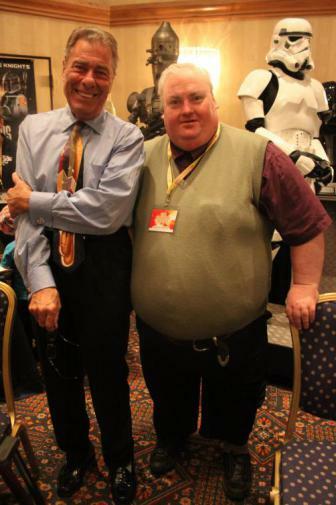 They are used to trade Cons and fan based events but really the largest Hobby based event ( DR Who and Terry Pratchett events) have till now attracted just about 400 folk. THAT is what they thought they were getting. I think they are still in shock after we opened the door and pushed 3500 people at them. The planning was done by a team of 5 of us – those of us in the Burgundy or as we like to say Imperial Purple shirts: John Dodd handles the RPG event schedule, Mick Pearson looks after our army of volunteers, Pat Campbell manages transport as well as some of the PR work. they all attend a number of meetings in the year as well as keep in contact through email and sometime skype. The vast bulk of planning of the floor plans, sorting stands out, timetabling the weekend and doing the huge Tetris game that is fitting Expo into its space is my role. Tony Hyams has the other wedge of planning and implementing the IT side of the show, ticketing, website as well as being more practical than I about physical solutions to problem. For example he designed the stand dividers as we needed a low cost alternative to expensive shell systems. 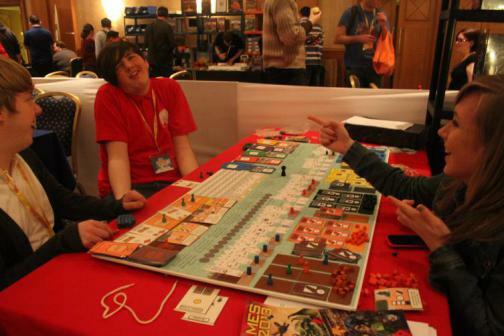 We two are the directors of UK Games Expo Ltd and share the actual financial risk. If you are thinking of running such an event I would say THINK HARD. Running Expo is not a job for the faint-hearted. I receive something like 4000 to 5000 emails a year and send out maybe 3000 a year for Expo. The great bulk is from Essen Spiel onwards, particularly the 2 months before the Expo when I can easily send and receive 50 emails a day. I am a GP in real life and Tony a church minister so this work load has to be fitted in around that. Things have got to the stage that Tony and I often spend 2 or 3 hours on skype on 2 or 3 nights a week for 4 or 5 months. Many nights we see 3am arrive before we call it a night – knowing we both have to be up for the day job in a few hours. I find I need to scatter a week or two of days off around the two months before Expo just to give me time to keep on top of everything. On top of the sheer workload anyone thinking of running such an event needs to think hard about the finances. The early years of Expo involved a personal risk of maybe £5000. The move to the metropole potentially raised that risk to tens of thousands. So it was an anxious year and we are certainly relieved that the gaming community supported the event. If you heard Tony at the awards ceremony thanking you for your support that was heartfelt by us all and in particular us two. So how did we get the numbers along? Well this sort of event needs to grow. You don’t just get the people to turn up. Getting the trade along is the first trick. This is the result of work going back to as far as 2006 when Pat Campbell and I hauled ourselves around stands at Essen, visited Midcon, Manorcon, Dragon-meet, Triples and Salute and many other events. Traders who have attended year on year since those early days need a particular thankyou for taking a chance when an unknown bunch of guys came to see them with a mad idea about a UK event based around Essen, Origins and Gencon Indy.The Expo model is not particularly common in the UK and many wargames traders in particular don’t really “get” the concept of demo games linked to stalls, ongoing events over 3 days, seminars and guests etc. We did not want to set up in a gym and present a trade show that looked like a car boot sale and lasted 4 or 5 hours. These are mostly soulless affairs with no buzz. We wanted it to be vibrant, colourful and exciting. We wanted families. We wanted costumed groups and people to come all weekend. We wanted community. That was at times a hard sell I can tell you. Then of course we needed to get the visitors along. Here we put in a vast amount of work year on year on Facebook, Twitter, Google Plus, our own website, our newsletter, various forums and so forth. WE attend other events like Essen, Dragonmeet, run events at the local shopping center or the Middle Earth Weekend and talk to the public. We pay for local newspaper advertising and look for coverage in a variety of online blogs etc. The actual Expo weekend starts for us about a week earlier when we switch off the booking and Tony prints and collates almost 900 orders as well as doing packs for volunteers etc. Meanwhile I am busy printing off final floor plans, table counts and so forth. Pat and Mick are usually busy doing errands like banking and finalizing Volunteer arrangements, John organsing his GM’s. We got the vans on the Tuesday and started loading the board game library and 40K terrain from our club. Wednesday last week saw us loading 300 wooden boards, acres of cloth and a vast ammount of other stuff from our storage garage. WE then stuffed 300 Goody bags which took 3 or 4 hours for about 12 of us. Thu we arrived at the hotel, set up HQ, had a briefing meeting and then went into the Trade Halls around 10pm to mark them up. That last job took Tony and 3 others 7 hours. He went to bed at 5.30a.m. about 1 hour before I got up with the other purples to get the tables in. Starting at 8am Friday it took 4 hours to set up the tables for the Trade halls and still more time the tournament rooms. Meanwhile our front desk were already letting in the hundreds who had arrived to game. It was hard work but when we ran out of Saturday tickets and Lanyards (we had 3000) we knew were wer OK – the plans were working and the support was there. I think it was about 12 noon on Sunday when I was able to actually look round the show free for about an hour of any issues and buy some stuff. As walked around with the goodies I was buying, I thought to myself “We did alright, didnt we”. Overall the feedback has been massively positive. We know about the beer and food issues, need to do more with parking and trader access, open gaming space etc. Many little things need fixing but that is event management. Replicate what worked, fix what didn’t. Most feedback is sensible and constructive, You always get some folk who think they are instant experts on what we should do better but most guys say common sense things. But so far on facebook, twitter and email the guys who think we did a good event outnumber the moaners by 20:1. I can live with that. So after the dust settles we get a few months off now and then the roller coaster begins again.